Sqoop is a useful tool inside the hadoop stack which will move data from traditional relation database (mysql, oracle, teradata..) to hdfs (hive) and vice versa. However, to correctly set up the driver for teradata, you need to use the cloudera teradata connector to make it work. If you are using Cloudera Manager, in the perfect world, it might just be a few clicks, download the teradata connector parcel, distribute, deploy and activate. 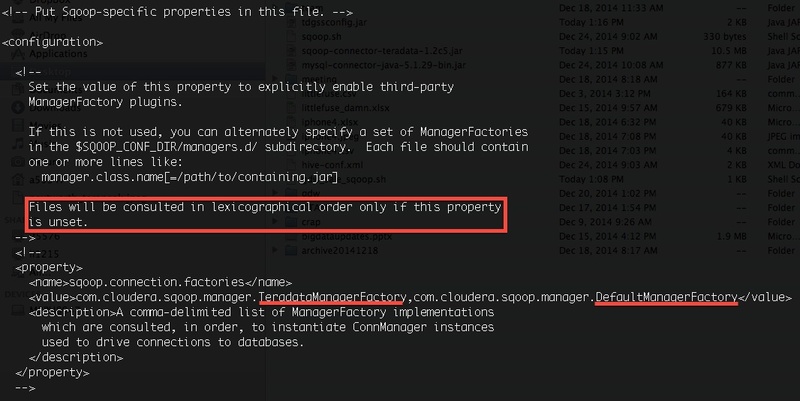 However, if you are living in a slightly different world, like me(cloudera manager is not working properly, you run into the error like manager factory cannot find the right class.). I had to manually create a folder named “manager.d” and place a configuration file under it which point the class to the right location of the teradata connetor jar file.